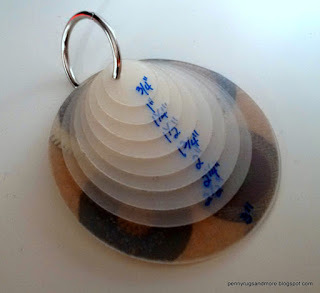 Here is my Pinch Purse tutorial. Thank you to all the ladies that asked for it, especially Ronnie. Time Life book that I thought I'd never make another one. Well, today with some research, I turned up some different techniques. This little one took no time at all to whip up. a clam shell, a pipkin, a thimble holder, or a victorian sewing box. Someone called it a brazil nut, others call it a beechnut, and others make them for Christmas ornaments. Nice to tuck a tiny gift inside and hang on the tree. I didn't stop to iron the fabric. My electricity was out. Excuse my crumples. I prepared six petal shapes from plastic. yogurt tub lids, or cereal box cardboard. The larger petal should be cut about 1/2" larger than the small ones. The large petal will be the template for the fabric. Fabric allowance of 1/2" is ideal. Trim 3 of the smaller petals down by scant 1/8 inch all around. You'll see why as you move along further. I used a lightweight wool with interfacing attached. It would be easier to work without the interfacing on this small version. I drew and cut lining pieces, also using the large template, from printed cotton. Note: allow about 1/2" of fabric all around. Layer the batting between your petal and your outer fabric . Note: batting only necessary if you want a puffy soft outer side. Pull up the stitches and secure. Make 3 with batting for outer pieces and 3 with no batting for inner pieces. Note: not shown here, secure with some large zig zag lacing stitches across the back, from one side to the other. the lining fabric around a trimmed smaller petal. Remember, you've trimmed 3 of your petals by a scant 1/8 inch to use for inside of the purse (liners). I am securing one of the corners. Fold and flatten the corners and tack both in place. this also helps tighten the fit. Here is the reason the lining petal should be smaller than the outer pieces. It helps with assembly to have the liner edges away from the edges of the outer petal. Make a ladder stitch all around the petal to join a liner to an outer petal. Notice how the lining of the center petal is centered. The other two, left and right, are slightly off center. This will help in assembly. one to each side of the base, or center petal. It took a while before I realized I was using a darning needle! Here I am making a simple whip stitch to join the first side. On the third side or the opening, stitch up from each point just a bit. Make a strong overcast tack stitch. You're done. Squeeze both ends to open. You can dress yours up with fancy stitches or embellishments. These are so cute!! I am collecting small things right now to make Christmas presents for my family and friends. These would be perfect for some of the things I will be making, plus be a gift in itself. May I have a copy of your pdf, please? Thank you for sharing. Now I will need to start going through my stash to personalize the colors to the people. Cute! I just might try to make one of these! Great tutorial, thanks so much. I will be making one! im a little confused...you made 6 templates, does that mean you sewed them in with the batting? Heather, batting is used on the outer three petals. The inner three are the liners and please trim them a scant 1/8" before covering with fabric. They will be slighty smaller for ease of joining the sides. Interesting to see how you make yours. I am a little different because I actually sew my inner and outer layers together leaving an opening to insert a cardboard template then stitching the opening closed. Like how you did yours by drawing up the outer stitches. I will have to try that. I am still making them in all sizes, in different materials and different techniques. These are called beechnuts by my family. I have my great grandmothers original one! They are addictive once you start making them! Hi! you're the beechnut lady! I need to try the machine stitched version again.... that was the post I did about the Time Life book pattern version. I think I was trying to hard. This version is great for a "take it and make it". Also, one note I skipped is after you do the running stitch and pull up, thread your needle across the back a few times, in a zig zag from one side to the other, just to reinforce holding the fabric in place. I made one of these not from you instructions another one and they used glue to hold down fabric well it was a nightmare sewing the lining on and then joining as the glue went hard and was very difficult getting the needle through.! I will have a go using your method as sounds much better. Thank. Pamela from Australia. Just made one, and it's adorable. Than you for the instructions! Thank you Colleen! I have collected wool over the years, once donating pounds to a local quilt shop. Never got around to overdying it! I have another collection, and appreciate your tutorials. Great to take along anywhere. thanks again! Hi Joan, thanks for the note. Very nice to hear you're enjoying my tutes. Keep on stitching! This looks so amazing! Is it the plastic templates that makes it pinchable? Is there a PDF pattern available?